It's no coincidence that email confirmation is enabled the first time you install the plugin. The last point is important. If you start thinking about your audience in quantity over quality. You'll want to increase your open rate, more than your total subscribers. Until a subscriber confirms, he simply won't receive anything. I have over 25% of unconfirmed subscribers! It's normal to have plenty of unconfirmed subscribers. If your mailing list is for an older generation of people or a group of computer illiterates, there's a good chance that your unconfirmed might be around 30% or more. Tip: make sure your confirmation email's subject is a call-to-action. A good example: Almost there... activate your subscription! A bad example: We've registered your subscription, thank you. How do I resend the confirmation email? Just select the subscribers that are unconfirmed, go to the Bulk Actions dropdown, select the option Resend confirmation email and hit the Apply button. Your audience might actually not go online regularly. When they get online, your confirmation email is lost in their inbox. Even worse, your confirmation emails get labeled as spam and never show up in the inbox. Your site is a membership site, and you only send to your WordPress users. 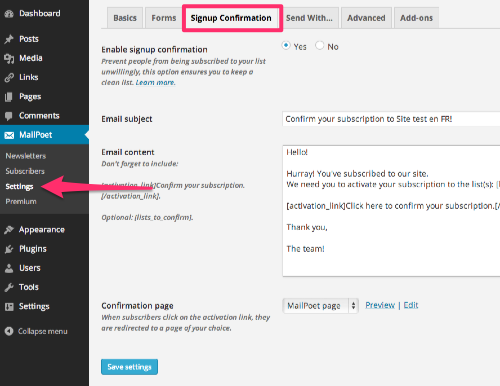 All unconfirmed subscribers become "subscribed" when you turn off the confirmation email feature. If you switch back, they'll become unconfirmed again.